Professional Upright - All of the raw materials are perfectly selected and produced. Extended length and full leverage piano action keys with BASF finish. Powerful yet compact design with a warm and clear European tone. This piano has Roslau Blue Label Strings, Made in Germany, and German VGF Felt in which helps project a full and powerfull bass, plus a crisp treble sound. Big sound in a compact design! At just 48″ in total height, the Strunz sounding board brings huge sound and colorful tones from this Schiller Concert Grand Piano! 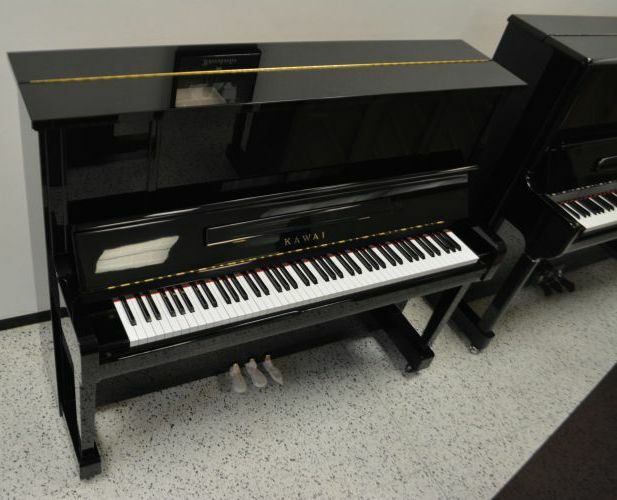 Schiller C48 Upright Piano with HP Carbon Piano Action is rarified high-performance. Concert C48 Upright Piano measures 48” in height. New concept HP Carbon Action is highly responsive with ABS Carbon and Carbon Fiber parts that maximize German Abel Hammers and the Strunz Sounding Board for a rich, crisp tone. The HP Carbon Action is 25-35% more efficient and also isolates the effects of climate and humidity. 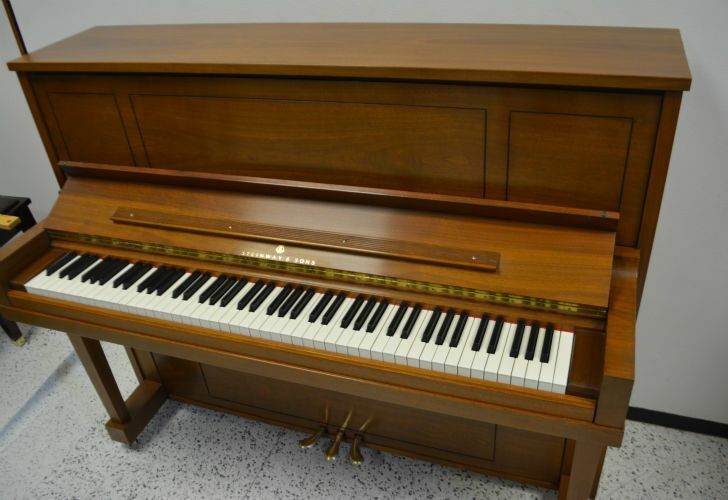 Sound – Touch – Assurance – Stability • Music Educators will appreciate the features of the 46″ Upright Studio Piano. Siberian Spruce Sounding Board, German VGF Felt and German BASF Finish come standard. A warm, crisp, clear sound and our well articulated Friedrich Piano Action ™ and Soft Practice Pedal come standard as well. Since 1885, it has been our passio to employ our artistic craftsmanship and knowledge to enable uncounted people, famous, well-known and unknown, to achieve their keys to happiness. Patience is the mother of quality. Sometimes, 300 years of patience are necessary. This is the age of some of our mountain spruce wood which is utilized for the manufacture of the soundboards. Strunz has been producing piano Sounding Boards exclusively in Germany since 1820. The Strunz Sounding Boards are harvested from select trees which grow in the higher elevations of the Alps. Their growth demonstrates even maturity which is evident in the fine ring structure of the tone wood. Stringent quality tests are done on each Sounding Board before the Strunz Quality “Made in Germany” Stamp is put on each Sounding Board. This high-quality tone wood acts as the heart of all of the Schiller Concert Grand and Upright Pianos. Our Schiller workers, along with those of Strunz, take great pride in their work which ultimately brings the Schiller sound to life for people the world over. The Schiller Piano Company has crafted a very important relationship with the Strunz Company. Carbon action parts maximize the strength of each keystroke delivered to the hammers and ultimately to the Sounding Board for a rich and crisp tone. Full size professional upright. All raw materials perfectly selected and produced. Extended length keys and Siberian Spruce Sounding Board produces flowing sound effortlessly. A complete, warm and clear European tone! Since 1885, it has been our passio to employ our artistic craftsmanship and knowledge to enable uncounted people, famous, well-known and unknown, to achieve their keys to happiness. The creativity with which the specialist journalists of musical periodicals describe our grand and upright pianos in the instrument tests in France is a pleasure in its own right. 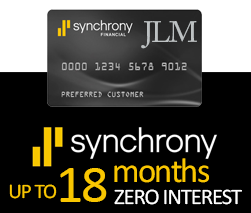 1885 is a momentous year for our company. It was in May of 1885 that Wilhelm Schimmel built his first piano. Inspired by a pioneer spirit and single-minded perseverance, his maxims were always oriented to the expectations of his customers. They could hear and feel the love and care with which his instruments were built and how they were up to standards of the tone quality and touch which even at that time were high. Even today, nothing has has changed in this respect. We stand behind our products with our name. Since 1885, it has been our passio to employ our artistic craftsmanship and knowledge to enable uncounted people, famous, well-known and unknown, to achieve their keys to happiness. We interpret tradition with a contemporary slant as illustrated by the K 125 Tradition which is inimitable in its combination of traditions of German artisan piano manufacture, innovative construction and contemporary design. This is perfection and aesthetics which will continue to enchant future generations. Innovation in Piano manufacturing and a sensitivity for the taste of time are the reasons why Schimmel became the largest manufacturer in Germany during the 20th century. In keeping the founder's motto 'Quality will prevail', Schimmel combined high quality with modern, advanced manufacturing processes. This has enabed pianists around the world to play a quality instrument. Schimmel is committed to this tradition with regard to the Schimmel International Series. Affordable quality instruments, reliable and straightforward - 'made in Braunschweig | Germany'. Schimmel grand and upright pianos are handcrafted according to a tradition of craftsmanship handed down over generations - with loving attention to every detail. This requires time, patience and a real empathy for the craft. The experienced Schimmel craftsmen are responsible for the 'Wilhelm Schimmel' brand being a guarantee of European sound and craftsmanship which allows the pianists an especialy enjoyable playing experience. 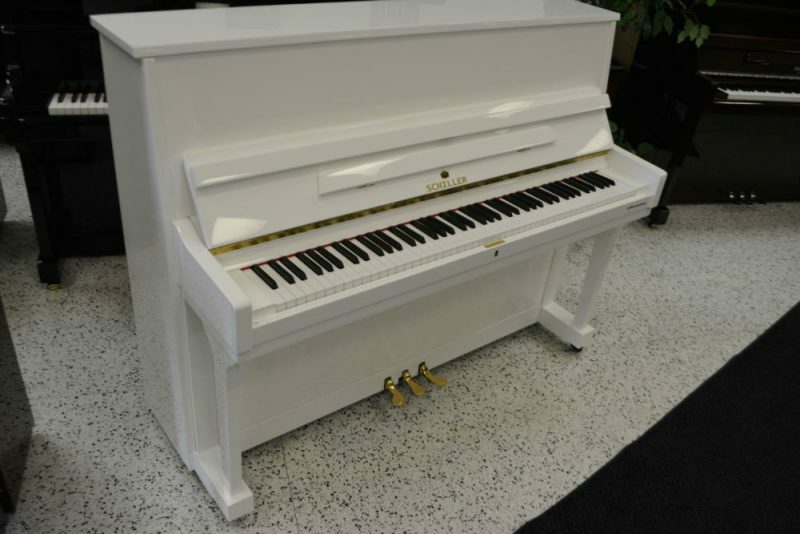 The 45” UP115E Institutional Piano is designed with teachers and students in mind. 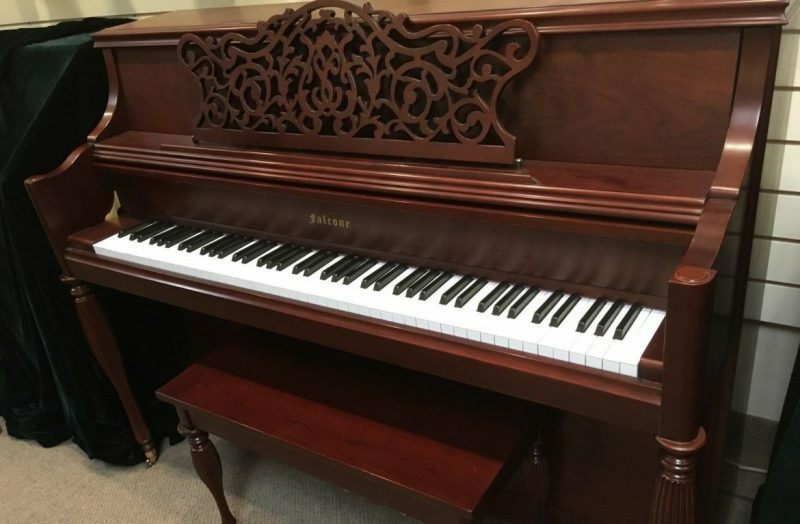 This model offers locking lid and key-covers for security, a double caster wheel design providing excellent maneuverability, a FULL LENGTH sheet music rack and a “Boston” style fallboard. The cabinet is fashioned after the famous Baldwin Hamilton Studio Piano formerly made in Truman, Arkansas, and is available in beautiful Ebony Satin and Mahogany Satin finishes. A small upright piano with a bright sound. The design fulfills the wish of understatement without influencing the play or sound. Traditional look, solid workmanship and European sound make this the entry into the world of fine European pianos. This remarkable piano was created for professional use in schools, churches and other institutions, and for anyone one who requires grand piano characteristics in a compact vertical size. The luxurious finish and elegant styling of this piano make it irresistible to the person looking to unite concert hall sound quality with impeccable furniture design. Pearl River combines the finest materials with precision engineering to produce an instrument comparable to the most prestigious brands at a fraction of the price. The EU122 has won praise from music industry magazines, the world’s #1 Piano Forum www.pianoworld.com and excellent reviews by the world’s #1 Piano Ranking website www.pianobuyer.com which designated the EU122 a “staff favorite!” Designed by the legendary Swiss Master Piano Designer, Lothar Thomma, the EU122 is a 48” studio piano suitable for players at any level. Strategically off-set backposts provide greater strength in the treble section of the piano where the most tension exists, and less in the bass, providing pleasingly-even tone across the piano. This is a feature normally reserved for pianos costing much more. Experienced craftspeople notch the bridge by hand. Premium German felt is used for the hammerheads, and butcher-block construction with spruce is used for the keybed, designed to withstand heavy use. Take a deep breath and savor the beauty! The luxurious finish and elegant styling of this piano make it irresistible to the person looking to unite concert hall sound quality with impeccable furniture design. Offering characteristics usually found in custom, handcrafted instruments, this piano will bring your family pleasure for generations to come. The UP110P10 is another in our series of home-sized pianos with big piano tone and projection. The striking Italian Provincial design includes elements of classic English styling to create the elegant details that blend well with any décor. The new UP110P10 includes all the technical advancements that have given Pearl River pianos their leading edge. The 45” UP115M5 Advanced-Design Studio Upright is one of the best selling “studio” pianos in North America, due to the model’s impressive construction and affordable price. The UP115M5 features a braced toeblock attaching the legs to the frame of the piano. This provides strength and makes this piano easy to roll on its high quality caster wheels. The new 46.5″ EU118S offers a contemporary look to a traditional studio piano. The silver colored hardware, pedals and casters give this model a fresh, clean and attractive style. All of Pearl River’s quality materials and processes are found throughout the piano’s 8,000 moving parts, including vertically laminated bridges for durability and crown retention, a responsive action allowing for a broad dynamic range, and quality hardwoods. An updated Pearl River EU122 with Silver Hardware - WOW! The exciting and new Pearl River EU131 builds on the success of the popular EU122, and is now the flagship model of the Pearl River vertical piano line! At 52″, the Concert Vertical EU131 has longer strings than some grand pianos, and delivers a rich, strong and inspiring tone sure to wow all who try it. Those who are looking for an excellent concert upright piano at an affordable price will find the EU131 to be the perfect choice!